The Einstein field equations (EFE; also known as Einstein's equations) comprise the set of 10 equations in Albert Einstein's general theory of relativity that describe the fundamental interaction of gravitation as a result of spacetime being curved by mass and energy. First published by Einstein in 1915 as a tensor equation, the EFE relate local spacetime curvature (expressed by the Einstein tensor) with the local energy and momentum within that spacetime (expressed by the stress–energy tensor). Similar to the way that electromagnetic fields are determined using charges and currents via Maxwell's equations, the EFE are used to determine the spacetime geometry resulting from the presence of mass–energy and linear momentum, that is, they determine the metric tensor of spacetime for a given arrangement of stress–energy in the spacetime. The relationship between the metric tensor and the Einstein tensor allows the EFE to be written as a set of non-linear partial differential equations when used in this way. The solutions of the EFE are the components of the metric tensor. The inertial trajectories of particles and radiation (geodesics) in the resulting geometry are then calculated using the geodesic equation. As well as obeying local energy–momentum conservation, the EFE reduce to Newton's law of gravitation where the gravitational field is weak and velocities are much less than the speed of light. Exact solutions for the EFE can only be found under simplifying assumptions such as symmetry. Special classes of exact solutions are most often studied as they model many gravitational phenomena, such as rotating black holes and the expanding universe. Further simplification is achieved in approximating the actual spacetime as flat spacetime with a small deviation, leading to the linearized EFE. These equations are used to study phenomena such as gravitational waves. where Rμν is the Ricci curvature tensor, R is the scalar curvature, gμν is the metric tensor, Λ is the cosmological constant, G is Newton's gravitational constant, c is the speed of light in vacuum, and Tμν is the stress–energy tensor. The EFE is a tensor equation relating a set of symmetric 4 × 4 tensors. Each tensor has 10 independent components. The four Bianchi identities reduce the number of independent equations from 10 to 6, leaving the metric with four gauge fixing degrees of freedom, which correspond to the freedom to choose a coordinate system. Although the Einstein field equations were initially formulated in the context of a four-dimensional theory, some theorists have explored their consequences in n dimensions. The equations in contexts outside of general relativity are still referred to as the Einstein field equations. The vacuum field equations (obtained when T is identically zero) define Einstein manifolds. Despite the simple appearance of the equations they are actually quite complicated. Given a specified distribution of matter and energy in the form of a stress–energy tensor, the EFE are understood to be equations for the metric tensor gμν, as both the Ricci tensor and scalar curvature depend on the metric in a complicated nonlinear manner. In fact, when fully written out, the EFE are a system of ten coupled, nonlinear, hyperbolic-elliptic partial differential equations. In standard units, each term on the left has units of 1/length2. With this choice of Einstein constant as 8πG/c4, then the stress-energy tensor on the right side of the equation must be written with each component in units of energy-density (i.e., energy per volume = pressure). The expression on the left represents the curvature of spacetime as determined by the metric; the expression on the right represents the matter/energy content of spacetime. The EFE can then be interpreted as a set of equations dictating how matter/energy determines the curvature of spacetime. These equations, together with the geodesic equation, which dictates how freely-falling matter moves through space-time, form the core of the mathematical formulation of general relativity. With these definitions Misner, Thorne, and Wheeler classify themselves as (+ + +), whereas Weinberg (1972) and Peacock (1994) are (+ − −), Peebles (1980) and Efstathiou et al. (1990) are (− + +), Rindler (1977), Atwater (1974), Collins Martin & Squires (1989) are (− + −). The sign of the (very small) cosmological term would change in both these versions, if the (+ − − −) metric sign convention is used rather than the MTW (− + + +) metric sign convention adopted here. Reversing the trace again would restore the original EFE. The trace-reversed form may be more convenient in some cases (for example, when one is interested in weak-field limit and can replace gμν in the expression on the right with the Minkowski metric without significant loss of accuracy). Since Λ is constant, the energy conservation law is unaffected. observations by Edwin Hubble confirmed that our universe is expanding. So, Einstein abandoned Λ, calling it the "biggest blunder [he] ever made". Despite Einstein's motivation for introducing the cosmological constant term, there is nothing inconsistent with the presence of such a term in the equations. For many years the cosmological constant was almost universally considered to be 0. However, recent improved astronomical techniques have found that a positive value of Λ is needed to explain the accelerating universe. However, the cosmological constant is negligible at the scale of a galaxy or smaller. The existence of a cosmological constant is thus equivalent to the existence of a non-zero vacuum energy. Thus, the terms "cosmological constant" and "vacuum energy" are now used interchangeably in general relativity. using the definition of the Ricci tensor. which expresses the local conservation of stress–energy. This conservation law is a physical requirement. With his field equations Einstein ensured that general relativity is consistent with this conservation condition. The nonlinearity of the EFE distinguishes general relativity from many other fundamental physical theories. For example, Maxwell's equations of electromagnetism are linear in the electric and magnetic fields, and charge and current distributions (i.e. the sum of two solutions is also a solution); another example is Schrödinger's equation of quantum mechanics which is linear in the wavefunction. The EFE reduce to Newton's law of gravity by using both the weak-field approximation and the slow-motion approximation. In fact, the constant G appearing in the EFE is determined by making these two approximations. 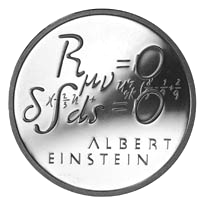 A Swiss commemorative coin from 1979, showing the vacuum field equations with zero cosmological constant (top). The solutions to the vacuum field equations are called vacuum solutions. Flat Minkowski space is the simplest example of a vacuum solution. Nontrivial examples include the Schwarzschild solution and the Kerr solution. Manifolds with a vanishing Ricci tensor, Rμν = 0, are referred to as Ricci-flat manifolds and manifolds with a Ricci tensor proportional to the metric as Einstein manifolds. in which the comma denotes a partial derivative. This is often taken as equivalent to the covariant Maxwell equation from which it is derived. However, there are global solutions of the equation which may lack a globally defined potential. The solutions of the Einstein field equations are metrics of spacetime. These metrics describe the structure of the spacetime including the inertial motion of objects in the spacetime. As the field equations are non-linear, they cannot always be completely solved (i.e. without making approximations). For example, there is no known complete solution for a spacetime with two massive bodies in it (which is a theoretical model of a binary star system, for example). However, approximations are usually made in these cases. These are commonly referred to as post-Newtonian approximations. Even so, there are numerous cases where the field equations have been solved completely, and those are called exact solutions. The study of exact solutions of Einstein's field equations is one of the activities of cosmology. It leads to the prediction of black holes and to different models of evolution of the universe. One can also discover new solutions of the Einstein field equations via the method of orthonormal frames as pioneered by Ellis and MacCallum. In this approach, the Einstein field equations are reduced to a set of coupled, nonlinear, ordinary differential equations. As discussed by Hsu and Wainwright, self-similar solutions to the Einstein field equations are fixed points of the resulting dynamical system. New solutions have been discovered using these methods by LeBlanc  and Kohli and Haslam. The nonlinearity of the EFE makes finding exact solutions difficult. One way of solving the field equations is to make an approximation, namely, that far from the source(s) of gravitating matter, the gravitational field is very weak and the spacetime approximates that of Minkowski space. The metric is then written as the sum of the Minkowski metric and a term representing the deviation of the true metric from the Minkowski metric, with terms that are quadratic in or higher powers of the deviation being ignored. This linearization procedure can be used to investigate the phenomena of gravitational radiation. Substituting this definition of the inverse of the metric into the equations then multiplying both sides by det(g) until there are none left in the denominator results in polynomial equations in the metric tensor and its first and second derivatives. The action from which the equations are derived can also be written in polynomial form by suitable redefinitions of the fields. ^ a b Einstein, Albert (1916). "The Foundation of the General Theory of Relativity". Annalen der Physik. 354 (7): 769. Bibcode:1916AnP...354..769E. doi:10.1002/andp.19163540702. Archived from the original (PDF) on 2012-02-06. ^ Einstein, Albert (November 25, 1915). "Die Feldgleichungen der Gravitation". Sitzungsberichte der Preussischen Akademie der Wissenschaften zu Berlin: 844–847. Retrieved 2017-08-21. ^ Misner, Thorne & Wheeler (1973), p. 916 [ch. 34]. ^ Carroll, Sean (2004). Spacetime and Geometry – An Introduction to General Relativity. pp. 151–159. ISBN 0-8053-8732-3. ^ a b Stephani, Hans; Kramer, D.; MacCallum, M.; Hoenselaers, C.; Herlt, E. (2003). Exact Solutions of Einstein's Field Equations. Cambridge University Press. ISBN 0-521-46136-7. ^ Rendall, Alan D. "Theorems on existence and global dynamics for the Einstein equations." Living Reviews in Relativity 8.1 (2005): 6. ^ Weinberg, Steven (1993). Dreams of a Final Theory: the search for the fundamental laws of nature. Vintage Press. pp. 107, 233. ISBN 0-09-922391-0. ^ Misner, Thorne & Wheeler (1973), p. 501ff. ^ Peebles, Phillip James Edwin (1980). The Large-scale Structure of the Universe. Princeton University Press. ISBN 0-691-08239-1. ^ Efstathiou, G.; Sutherland, W. J.; Maddox, S. J. (1990). "The cosmological constant and cold dark matter". Nature. 348 (6303): 705. doi:10.1038/348705a0. ^ Collins, P. D. B.; Martin, A. D.; Squires, E. J. (1989). Particle Physics and Cosmology. New York: Wiley. ISBN 0-471-60088-1. ^ Gamow, George (April 28, 1970). My World Line : An Informal Autobiography. Viking Adult. ISBN 0-670-50376-2. Retrieved 2007-03-14. ^ Wahl, Nicolle (2005-11-22). "Was Einstein's 'biggest blunder' a stellar success?". Archived from the original on 2007-03-07. Retrieved 2007-03-14. ^ Turner, Michael S. (May 2001). "Making Sense of the New Cosmology". Int. J. Mod. Phys. A. 17 (S1): 180–196. arXiv:astro-ph/0202008. Bibcode:2002IJMPA..17S.180T. doi:10.1142/S0217751X02013113. ^ Brown, Harvey (2005). Physical Relativity. Oxford University Press. p. 164. ISBN 978-0-19-927583-0. ^ Trautman, Andrzej (1977). "Solutions of the Maxwell and Yang–Mills equations associated with Hopf fibrings". International Journal of Theoretical Physics. 16 (9): 561–565. Bibcode:1977IJTP...16..561T. doi:10.1007/BF01811088. .
^ Ellis, G. F. R.; MacCallum, M. (1969). "A class of homogeneous cosmological models". Comm. Math. Phys. 12 (2): 108–141. Bibcode:1969CMaPh..12..108E. doi:10.1007/BF01645908. ^ Hsu, L.; Wainwright, J (1986). "Self-similar spatially homogeneous cosmologies: orthogonal perfect fluid and vacuum solutions". Class. Quantum Grav. 3: 1105–1124. Bibcode:1986CQGra...3.1105H. doi:10.1088/0264-9381/3/6/011. ^ LeBlanc, V. G. (1997). "Asymptotic states of magnetic Bianchi I cosmologies". Class. Quantum Grav. 14: 2281. Bibcode:1997CQGra..14.2281L. doi:10.1088/0264-9381/14/8/025. ^ Kohli, Ikjyot Singh; Haslam, Michael C. (2013). "Dynamical systems approach to a Bianchi type I viscous magnetohydrodynamic model". Phys. Rev. D. 88: 063518. arXiv:1304.8042. Bibcode:2013PhRvD..88f3518K. doi:10.1103/physrevd.88.063518. ^ Katanaev, M. O. (July 7, 2005). "Polynomial form of the Hilbert–Einstein action". Gen. Rel. Grav. 38: 1233–1240. arXiv:gr-qc/0507026. Bibcode:2006GReGr..38.1233K. doi:10.1007/s10714-006-0310-5. Weinberg, Steven (1972). Gravitation and Cosmology. John Wiley & Sons. ISBN 0-471-92567-5. Peacock, John A. (1994). Cosmological Physics. Cambridge University Press. ISBN 978-0521410724. Caltech Tutorial on Relativity — A simple introduction to Einstein's Field Equations. Video Lecture on Einstein's Field Equations by MIT Physics Professor Edmund Bertschinger.